A large guided anthology of theories of myth with extensive introductions and bibliographies. Many of the books excerpted or discussed here were reprinted in a series called “Myth and Romanticism” 52 vols. Garland Publishing, 1978-84. The 1972 edition has a foreword by Mircea Eliade; the new edition of 2000 has an additional introduction by Wendy Doniger. Chosen as May 1975 selection of Reader’s Subscription Book Club. Paperback ed. 1975. My translation of Fontenelle’s “Of the Origin of Fables” was reprinted in Readings in Mythology, Arno Press, 1978. 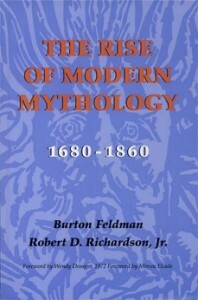 The Rise of Modern Mythology was reissued by Indiana Univ Press in 2000 with a new preface by Wendy Doniger.